How many sweet tart hearts of each color? What would be an estimate that is too high? Too low? Hello! Thank you for this 3-Act math. I have a question. I see how students can find a total of sweet tarts based on the serving size recommendation and total number of servings. Your answer shows there is not a clear division of colors per bag however. Is there anything more in Act 2 you can provide to help students paint a more accurate picture of how many of each color this is other than dividing their total by 5? Thank you. Perhaps you can assign a fraction for each color to the attached work document? Thanks for the comments! The fractions were intentionally left off of the document. My goal is for students to estimate the fraction of each color of sweet tart hearts. Every time I have done this with students, they estimated quite accurately – and reasoned about fractions in the process. Students intuitively reasoned that the fraction of pink was 1/3 and that the color that blue (which is about half of that would be 1/6 of the total bag. 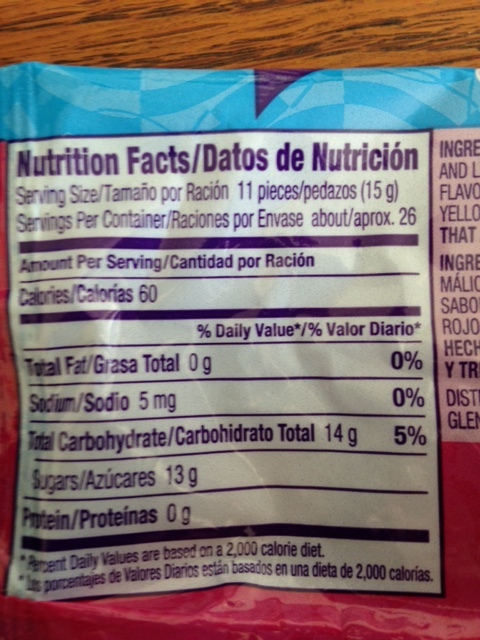 Also, students don’t know exactly how many sweet tarts are in the bag (though they can estimate from the serving size and number of servings on the bag), so they have to estimate and realize that the number they use is an estimate even though they may be doing some specific computation to get it. They need to estimate the fraction of each color as shown on the work document. There is a lot of estimation and that is completely intentional. When students get their solutions for each color and are presented with the solutions in act 3, I love to watch them react. Typically, due to all of the estimation, they may be off by a bit for a color or two, but usually pretty close. This creates a natural discussion in class where students share their estimates, construct viable arguments and critique each others’ reasoning. Hi there! This explanation makes complete sense. Thank you for taking the time to respond. I love the power students are given to decide, estimate, and make purposeful mathematical decisions. You are giving them power in their learning. I will try this with my group of 4th graders next month after they have gotten a grounding in basic fractions. Thanks again! Great! Please share how the lesson goes. I’d love to hear it! Fantastic. Please share after the lesson. I’d love to hear your insights after teaching this lesson.